Jeff Green picked up the 96th last-place finish of his NASCAR XFINITY Series career in Sunday’s Johnsonville 180 at Road America when his unsponsored #93 RSS Racing Chevrolet fell out with a vibration after 2 of the race’s 45 laps. The finish, which came in Green’s 470th series start, was his seventh of the 2017 season and his first since the July race at Iowa, four rounds ago. With ten races to go, Green is just four finishes away from becoming the first driver to score 100 last-place finishes in a single season. He also leads the 2017 LASTCAR XFINITY Series Championship by two finishes, putting him in position to break J.D. McDuffie’s record of five career LASTCAR titles. It’s been a difficult couple of weeks for Green and the entire RSS Racing team following the unexpected death of Shane Sieg, older brother of teammate Ryan Sieg. While Ryan gave RSS Racing its first Truck Series start at Milwaukee in 2009, Shane had been active in the series since 2003, racing for underdogs like Gene Christensen and Bobby Dotter to the strong Billy Ballew Motorsports entry in 2008. His best finish in Trucks actually came for Dotter, again at Milwaukee, in 2004 when he finished 8th. Shane also shared much in common with Jeff Green, performing the “start-and-park” role for the team, scoring three last-place runs of his own. On August 19, 2017, just under six years after he was suspended under NASCAR’s substance abuse policy, Shane lost his life at age 34. Green was one of 43 drivers on the preliminary entry list. Statistically, Green was a favorite to finish last in Sunday’s race. It was in this race in 2012 that he took the all-time LASTCAR lead from Derrike Cope, and in 2015, his record-setting eighth consecutive last-place finish. The effort would be aided following the withdrawals of three last-place challengers. First, the entry list was immediately cut to 42 as JD Motorsports withdrew their “start-and-park” #15 before a driver could be announced. By the end of the week, Motorsports Business Management withdrew their own “start-and-park” #72, back on the circuit for the first time since Loudon. John Jackson was originally listed to drive the car once more, but Timmy Hill was switched into it before the car was withdrawn. Third to leave the track early was first-timer Gregory Vandersluis, who on Sunday morning tweeted that Obaika Racing’s #77 Chevrolet “was not ready” and had not completed a lap in either practice session. 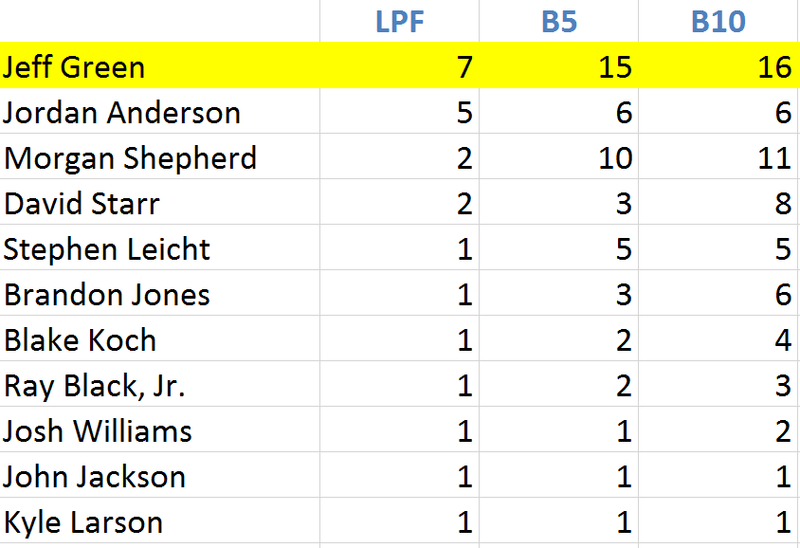 With that, the 40 remaining drivers were guaranteed a starting spot in Sunday’s race. Though NASCAR had brought Goodyear’s rain tires to the track, Sunday morning’s qualifying session was cancelled by rain. This put Jeff Green 31st on the grid based on his Past Champion’s Provisional for his 2000 XFINITY title. A day earlier, Green had run both practices, taking 29th in the first session and 31st in Happy Hour. Starting last in the race was Nissan road racer Nicolas Hammann, who was making his first XFINITY Series start since this same race last year. Now as then, Hammann was originally slated to run Mike Harmon’s #74 Dodge for Veterans Motorsports, Inc., but this time, on Friday, he had a new ride. John Graham was listed in the #74 with sponsorship from the New York Islanders hockey team, giving the Irish-Canadian sports car driver a shot to make his first XFINITY start since 2007. Hammann, meanwhile, would drive a second black Harmon-prepared Dodge. Carrying car #17, with Rick Ware as the listed team owner and sponsorship from Trudell Performance, Hammann was the only driver in the field whose team had yet to make a start in 2017, securing him the final starting spot. While Sheldon Creed joined him in the rear after missing driver introductions, Hammann held down the last spot early, trailing the leader by 7.096 seconds on the opening lap, then dropped to 23.009 at the end of Lap 1, less than a tenth of a second behind Graham’s #74. Jeff Green, meanwhile, ran 37th at the end of Lap 1, but ducked down pit road at the end of Lap 2, dropping him a full 46.268 seconds behind the leader and 11.648 seconds behind the now-39th-place Graham. The #93 pulled behind the wall that time by, securing the last-place finish. Finishing 39th on Sunday was Trans-Am point leader Ernie Francis, Jr., whose series debut in Motorsports Business Management’s #13 Frameless Shower Doors Toyota ended with a blown engine. 38th went to Sheldon Creed, who for the second-straight road course race was sidelined by mechanical issues in th e#01 United Rentals Chevrolet. Despite his pre-race penalty, Creed had worked his way up to 10th at the end of Stage 1, only to exit with a vibration soon after the restart. 37th went to outside-polesitter James “J.D.” Davison, whose “Days of Thunder” inspired #20 Hollinger Motor Sports Toyota incurred a speeding penalty after winning Stage 1, trapping him in the middle of a wreck triggered by Justin Marks and Ross Chastain. Rounding out the Bottom five was Tim Cowen, who very nearly drew the final caution when he stuffed his #40 Cowen Logistics Dodge into the tires in the final laps. Cowen managed to limp his car back to the garage, at which point he was listed out. But the story of the day belonged to another underdog, race winner Jeremy Clements. In 255 previous starts, Clements had never finished last, but only once scored a Top 5 – a 4th last year at Talladega. Clements’ XFINITY debut came at Pikes Peak International Raceway on July 26, 2003, when he ran 31st for part-time team owner Jerry Young. In 2011, Clements and his family started Jeremy Clements Racing, fielding the #51 Chevrolet. South Dakota-based RepairableVehicles.com signed as a sponsor that year at Iowa, and for most of the races since, it’s been one of the only brands on his car. Ever since 2011, Clements has ranked no worse than 16th in points, but no better than 14th. He arrived at Road America 18th in the standings with just one Top 10, a 7th at Iowa. His car was old – very old – the chassis built in 2008. In six previous Road America starts, just once did he finish better than 23rd - but that day in 2014, he finished 6th. Then, following a daring series of pit calls and a charge through the field, Clements reeled in race leader Matt Tifft for the high-powered Joe Gibbs Racing team – reeled Tifft in so fast that he lost control coming to the white flag, sending both cars into a spin off the final corner. But with the lead both drivers built up, Clements managed to get his car pointed the right direction and keep the lead, hanging on to beat Michael Annett to the checkered flag – Clements’ first XFINITY Series victory. The win so surprised the NBC crew that the camera crew had difficulty discerning Clements’ black #51 Chevrolet from several other black Camaros in lapped traffic - at one point, they mistakenly tracked David Starr’s #99. Next Saturday, Clements returns to his home track, the Darlington Raceway, where he’ll run a throwback paint scheme honoring A.J. Foyt. 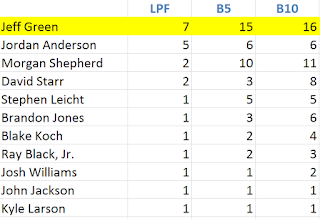 Filling out the Top 10 were Casey Mears in 9th, the best finish by Biagi-DenBeste Racing since Aric Almirola’s Daytona win last year, and 10th-place Parker Kligerman, who while serving as NBC’s in-race reporter went from starting next to Nicolas Hammann in the final row to earn Rick Gdovic’s Precision Performance Motorsports’ first top-ten finish, besting Quin Houff’s mark of 12th last month at Iowa. 12th on Sunday went B.J. McLeod’s #8 Chevrolet with road racer Josh Bilicki, who had never before finished better than 27th in eight previous NASCAR starts. And, running without a sponsor, J.J. Yeley kept TriStar Motorsports’ #14 Toyota in the lead pack for several laps before he settled for 17th. 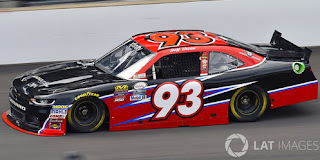 *This marked the first last-place finish for car #93 in an XFINITY Series race at Road America since June 21, 2014, when Kevin Lepage’s JGL Racing Dodge had rear gear trouble on the opening lap of the Gardner Denver 200 Fired Up by Johnsonville. I do not have any other information at this time.